Nitrogen fixation anniversary: Modern agriculture needs to use fertilizer more efficiently. Synthetic nitrogen was born 100 years ago; it’s why half of us are alive. Consider Carl Bosch our leading candidate for a modern Prometheus. This year marks a century since Bosch, a chemist, opened the Oppau, Germany-based Stickstoffwerke (“nitrogen works”)—the first factory to produce synthetic ammonia, the main ingredient of chemical fertilizers. It was an impressive technical feat that helped earn Bosch the Nobel Prize in 1931. His fellow chemist Fritz Haber had pioneered and patented the process for “fixing” inert nitrogen (the gas that makes up 78 percent of the atmosphere) into a usable, reactive form. Bosch figured out how to do it economically and on a large scale. Modern agriculture was born when an abundant supply of synthetic nitrogen started flowing at Oppau. The Haber-Bosch process busted wide open the natural limits on plant growth. Nitrogen is a building block of all proteins and other molecules necessary for life, including DNA, and a critical nutrient for all plants and animals. Most of the nitrogen naturally fixed from the atmosphere for plant use is captured by bacteria that grow on the roots of legumes like peas and bean plants. Ammonia is transformed by these symbiotic bacteria into nitrates, which are then taken up by plants. Until 1913, cultivating legumes, recycling manure and crop residues, and mining deposits of bird droppings in South America were the primary sources of nitrogen in agriculture. Bosch figured out how to react hydrogen culled from natural gas with atmospheric nitrogen at very high temperatures and pressures and in the presence of an iron-based catalyst. The resulting ammonia gas could be easily transformed into ammonium nitrate or urea for use in fertilizers. His work effectively removed the primary limiting factor that kept human populations in check. Where would we be without this feat of modern alchemy? Well, for starters, many of us wouldn’t be without it: Half of us wouldn’t be alive today if not for synthetic nitrogen. The Oppau Stickstoffwerke was a kind of existential hinge. In 1913, there were about 1.7 billion people in the world, and the factory fixed about 7,300 tons of nitrogen in its first year. Today there are 7 billion of us and more than 120 million tons of nitrogen are produced every year using techniques that haven’t changed all that much. More than 80 percent of that reactive nitrogen goes into fertilizers for agriculture. A 2008 paper in Nature Geoscience contains a remarkable graph showing how closely world population growth has tracked the increase in fertilizer production—and how a world without it could sustain only 3.5 billion people. That counterfactual can make one’s head swim a bit. It’s like imagining the Back to the Future scenario of your parents never marrying, but on a global scale, or the plot for a Malthusian-themed Newt Gingrich alternative-history novel. Another mind-blowing way to think about it: On average, half of the nitrogen in your body was synthetically fixed. For this reason alone, the Haber-Bosch process is considered by many scientists and historians to be the most transformational technological development of the modern age. But the case gets even stronger once you consider all of its unintended consequences. For, as with the original Prometheus, progress always comes with a price, in this case water and air pollution, deteriorating human health, reduced biodiversity, soil acidification, and accelerated global warming, to name a few. This nitrogen cascade manifests in a variety of ways. Nitrogen oxides contribute to the production of ground-level ozone, or smog, which increases the risk of serious respiratory illness and cancer; a different problem arises in the stratosphere, where these gases destroy beneficial UV-blocking ozone. Nitrogen fertilizers also stimulate natural bacteria to produce more nitrous oxide, which contributes to acid rain and is a greenhouse gas that traps 300 times more heat per molecule than does carbon dioxide. Reactive nitrogen infiltrates surface streams and groundwater, polluting drinking wells. Excess levels of nitrogen in some ecosystems bolsters some species at the expense of others, leading to overall reduced biodiversity. Perhaps the most visible impacts are the huge “dead zones” in the Baltic Sea and other areas downstream from farms. 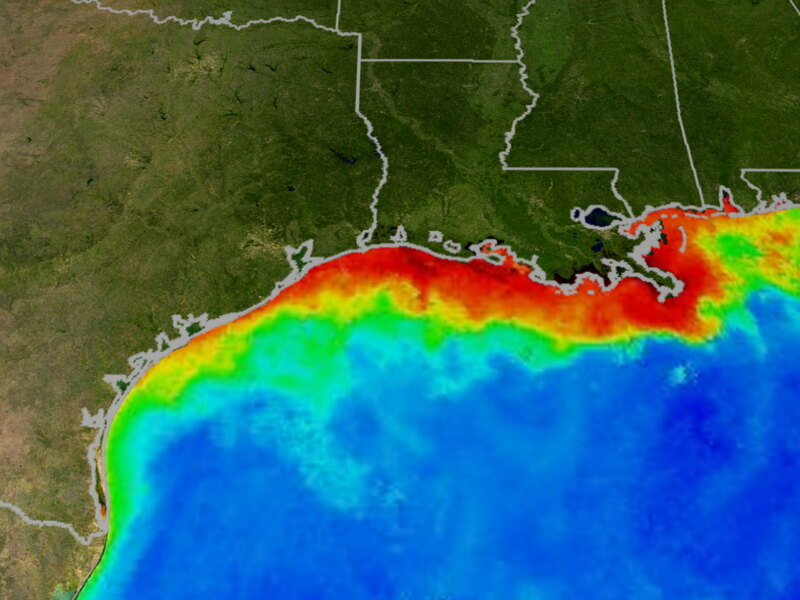 One of the worst is in the Gulf of Mexico, where fertilizer runoff carried by the Mississippi River feeds huge algae blooms that deprive other organisms of oxygen. The zone changes in size depending on the flow volume of the river and other seasonal factors. Last year it was about 6,700 square miles—larger than Connecticut. Our use of synthetic nitrogen is head-scratchingly inefficient: One study found that for every 100 grams of synthetic nitrogen used in agriculture in 2005, only 17 grams found their way into crops or animal products consumed by humans. Most farmers only have two data points available to judge the efficiency of their fertilizer use: their crop yield and the amount of nitrogen they apply each year. Those are very crude proxies. In between those events, a vastly complex set of chemical reactions takes place in soil, plants, and the atmosphere that researchers are still working to understand. “The farmers really don’t want to lose yield,” Davidson says. “The problem is that nitrogen is a relatively cheap insurance policy. In most years they won’t need it but in a few years they will.” He points to a lack of incentives to use nitrogen judiciously. Farmers from China to Iowa are under pressure to maintain high yields and profits. There’s little penalty for overapplying synthetic nitrogen but a significant perceived risk to underapplying it. The lack of farm-level data on yields, timing, rate, and amount of nitrogen application, indigenous soil nitrogen, and other important variables is a key factor holding back improvements in nitrogen-use efficiency. “It’s surprising how little data there is,” says Kenneth Cassman, a professor of agronomy at the University of Nebraska–Lincoln. “We have some idea, but it’s not good enough when we have to double food production and reduce environmental impact all in the next 30 years” to meet anticipated demand from a growing global population. The small fraction of applied nitrogen that gets taken up by crops is one source of inefficiency. But we are profligate even with the nitrogen that actually makes it into the plant. Last month, the United Nations Environment Program released a study detailing some of the compounding sources of inefficiency. For example, worldwide about 80 percent of nitrogen harvested in crops and grass goes to feed livestock instead of feeding people directly. Much of that nitrogen winds up in their manure and then gases off as it sits in giant open lagoons near intensive animal production centers or when it is spread onto fields without being properly mixed into the soil. And according to the U.N. Food and Agriculture Organization, a whopping one-third of all food produced globally is wasted—discarded by consumers or lost or spoiled before reaching the market. The UNEP study authors propose a “20:20 for 2020” target of improving nitrogen use efficiency by 20 percent and reducing overall nitrogen use by 20 million tons each year. They also suggest that consumers in developed countries become “demitarians” by reducing their meat consumption by half, since meat-based diets are much less nitrogen-efficient than plant-based diets. But “all of the demand for increased livestock products is coming from India, China, Africa,” Cassman says, so reduced consumption of meat in richer countries “doesn’t make much difference for projections of food supply and demand.” Indeed, 80 percent of the global increase in consumption of nitrogen fertilizers between 2000 and 2009 came from India and China. 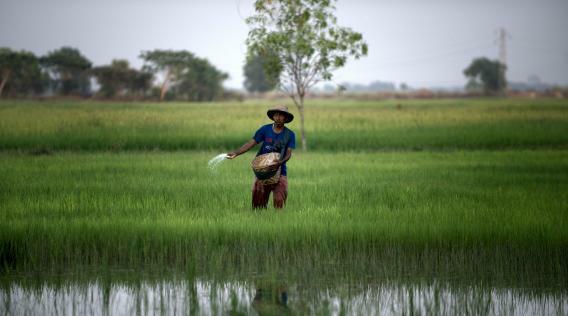 Cutting back on agricultural production is not much of an option in a world where the population is expected to reach 9.2 billion (and possibly as high as 10.5 billion) by midcentury. Such information could help policymakers design better incentives to encourage more farmers to adopt promising techniques for reducing nitrogen loss, such as conservation tillage (using little or no plowing), soil erosion control, planting winter cover crops, and more precise management of the timing, rate, and volume of fertilizer application. Davidson points to efforts to limit farming near streams and in 100-year flood plains as other steps that can make a dent in the problems associated with nitrogen runoff. After a century of nitrogen fixation, it’s hard to even imagine a world without it. And sheer demographic momentum means we will continue to rely on it until the next Carl Bosch comes along to upend the rules of agriculture. While Oppau’s legacy today reaches into every corner of the globe—and our bodies—the facility itself didn’t last that long. In 1921, workers discovered that 4,500 tons of ammonium nitrate stored in a warehouse had hardened during a period of wet weather into an unusable mass. So, to loosen it up, they drilled holes in it, stuck some dynamite in, and lit the fuse. The resulting blast killed more than 500 people (including those workers), destroyed 80 percent of the homes in the town, and ripped the roofs off of homes 15 miles away. It’s difficult to blame them, though, since no one knew at the time about the fertilizer’s explosive properties. And they were keen to not let such a valuable resource go to waste.